Advocates Say Shark Populations Under Threat From 20 Nations : The Two-Way While we usually think of sharks as hunters, it turns out that they are often the hunted. About 73 million sharks are killed by humans annually, many to satisfy Asia's appetite for shark fin soup. 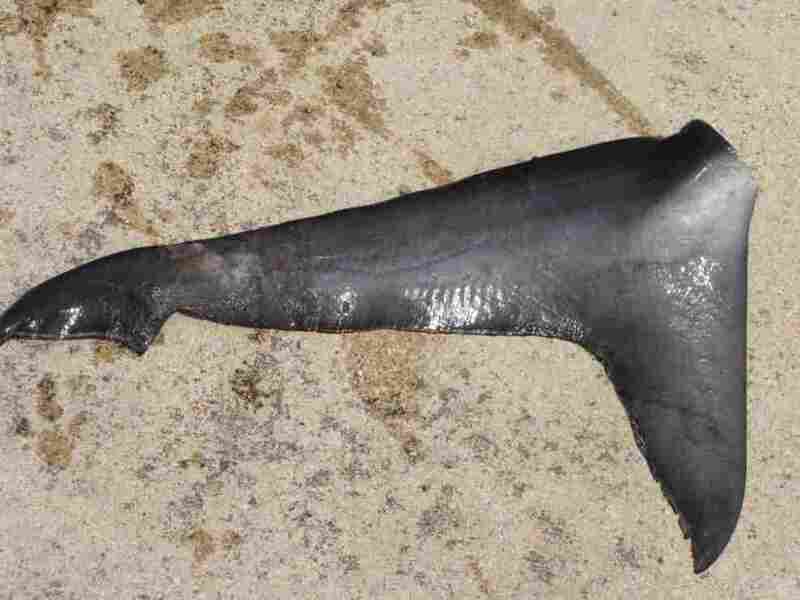 This undated photo provided by the Micronesian Shark Foundation shows a shark tail from an allegedly illegal Taiwanese fishing vessel busted in Palau on Aug. 5, 2009. The tiny Pacific nation of Palau is creating the world's first shark sanctuary. While we usually think of sharks as hunters, it turns out that they are often the hunted. About 73 million sharks are killed by humans annually, many to satisfy Asia's appetite for shark fin soup. More than 100 governments agreed to a 1999 U.N. plan intended to curb or end overfishing of sharks. Now two environmental groups say that signatories to the agreement have failed to follow through on plans to conserve the global shark population. Traffic and the Pew Environmental Group say that the top 20 shark-catching nations account for 80 percent of the annual kill and hold the key to saving the 30 percent of shark species facing the possibility of extinction. "Jill Hepp, manager of shark conservation for Pew, said sharksplay a critical role in the ocean environment." "'Where shark populations are healthy, marine life thrives; but where they have been overfished, ecosystems fall out of balance,' she said." The U.N. body that overseas the shark agreement meets next week with member nations. Traffic and Pew are urging them to review actions taken since the agreement to see who has and hasn't made progress managing their fisheries.